Today, Ho Chi Minh City has a lot of attractions, some purpose-built for tourists, but many others have been for historical reasons. Built in the same style as a traditional Vietnamese temple, the Ben Duoc Monument is a monument to the war martyrs, to remember the people who loss their lives in the south of Vietnam during the Vietnam War. The memorial day is the 19th of December. It is near to the Cu Chi Tunnels. Excavated with simple hand tools in the 1940s, the Cu Chi Tunnels stretched all around Ho Chi Minh City, allowing the Viet Cong easy access around the region, as well as a hiding spot at night. Today, it attracts many tourists trying to get a small taste of what life was like in the Vietnam War. Opened in 1991, the Fine Arts Museum consists of three floors, with exhibits by Vietnamese artists as well as foreign artists. There are many items on display, including Champa and Oc Eo work, antique Vietnamese ceramics, and traditional Vietnamese handicrafts. The Nam Bo Women’s Museum opened in 1985 as a place for meetings, education, and cultural exchanges between women. The museum consists of 10 display rooms, a movie theatre and a library on the traditions of women. Officially known as the Thong Nhat Conference Hall, this building was where the French Governor would have lived. It was then rebuilt in 1966 by the President of South Vietnam. 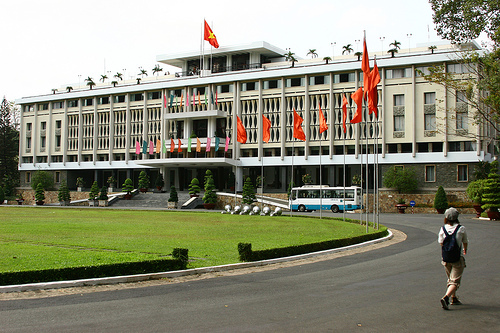 On the 30th of April, 1975, the Palace was taken by the Viet Cong, and turned into a temporary location for an ‘Administrative Committee’. In December 1975, the palace was used to announce the national reunification. Opened in 1975, it contains items and photographs from the Vietnam War. With a special focus on American war crimes, may photos show civilians being killed, or bombs and chemicals being dropped. Outside, jeeps, tanks, planes, and helicopters are on display. Despite being obviously biased, around a million foreign visitors have been to the museum, including American tourist. It may not be the fairest representation of history, but it is what the Communist Party believes. One of the biggest and most popular markets in Ho Chi Minh City for tourists, Ben Thanh Market has lots of different products for tourists and locals to buy. However, it does have more clothes and souvenir shops than other markets due to the large amount of tourists. The market is a great place to practice bargaining, and perhaps pick up a good deal or two, but there is the danger of pickpockets. Also known as Chinatown, Cholon literally means “Big Market”. In 1778, the Chinese residents of Bien Hoa fled to what is now Cholon. As Saigon grew bigger, it gradually merged into one city. In 1931, the city had been renamed as Saigon-Cholon, and by 1956, it had become part of Saigon. During the Vietnam War, the market sold lots of American of US Army issued items. Today, it attracts many Chinese tourists, as well as people wanting to buy US Army Hardware.